How would you fine folks out there like a story where a comic book hero, whose life is constantly besieged with enemies, lost loves, and insurmountable odds on a near-weekly basis, finally gets tired of it and decides to kill the person who’s always stacking the deck against him, namely his writer? If you raised an eyebrow or leaned a little closer, welcome to Jen Finelli’s Becoming Hero. If there’s any one I can call my protégé in this business, it’s Jen. She’s been listening to my good but weird (or is it weird but good?) writerly advice for a few years now, soaking in the big points and tailoring the finer points to match her own witty and irreverent voice. You can see a great example of that in Brain Worms and White Whales, which is free to listen to and read over at Escape Pod. Jen wants to bring to life this very meta story of a comic book hero getting revenge for all the torturous machinations we writers cook up, and when I say to life I mean full on color life. She wants to hire graphic artists and a voice actor to provide some high quality audio and kickass visual aesthetics on the ebooks, audiobooks and physical print copies. That costs a bit of coin and there’s a reason why the words “starving” and “artist” go together like chocolate and peanut butter. That’s where you guys come in. I invite you to go over to Jen’s Indiegogo page for Becoming Hero. It’s very hard to not get excited by the premise and all the cool rewards she’s got in store for backers. Plus there are contests and games, no matter your backing pledge amount, coupled with a real and altruistic sense of community and plain giving back. At the time of this post, she’s about $1200 short of reaching that dream goal of fully funded. So head on over there and check out the project! Intelligence Report: H.G. Wells, Secret Agent – FREE for 2 days! You guys know I take my humor seriously. Fun stuff comes along so infrequently you know, and I’ll be damned if I write it all myself. So when Alex Shvartsman, the driving force behind the Unidentified Funny Objects anthologies, puts a fun action novella out for free (FREEEEEE) not only do I pick it up, I tell you guys to pick it up. H.G. 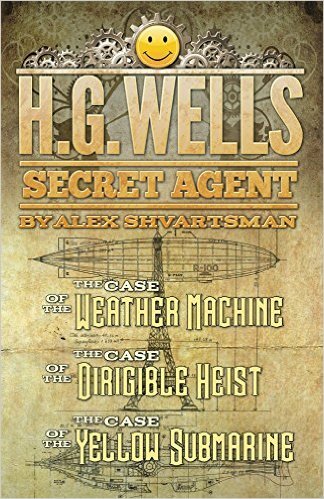 Wells, Secret Agent is a romp through Victorian-era England, with Wells as a steampunk style James Bond. Fun, Fast-paced, Frivolously anachronistic.. for FREE! Get it here! Read it! Leave a review or just come back here and tell me what you think. But you guys gotta act on it A.S.A.P. – the free status only lasts today and tomorrow.